Today is Nikola's 9th Birthday and I can't believe or rather difficult to accept that my baby is growing up so quickly! He has a kind heart, is understanding, compassionate, funny, smart, helpful, cute and the list goes on and on. I am very proud, thankful and blessed to be able to call him my son!! 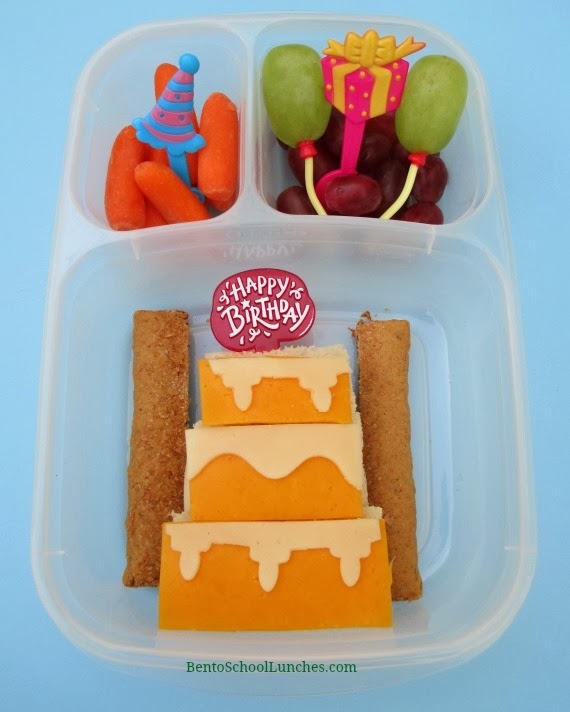 Cake layer sandwiches with Colby cheese frosting and provolone icing cut with the lunch punches sweet set. Also, fig bar cut into halves. Topped with a Happy Birthday cupcake pick. Seedless red and green grapes. This lunch is packed in an Easylunchboxes container. Cute and fun lunch! Happy Birthday to your son! Happy Birthday to Nikola! What a beautiful birthday lunch! Happy Birthday to Nikolai!! U must be a proud Mummy, he's such an awesome boy!